Philadelphia has more people commuting by bicycle, per capita, than any of the other ten biggest cities in the United States. In 2012, the U.S. Census estimated Philadelphia’s bicycle commuting rate at 2.3%, higher than Chicago (1.6%) or New York (1.0%). Every month more people in our region are discovering the ease and fun of bicycling to work. Our staff offers 1-hour workshops on bicycle commuting. Learn how to bring one of these workshops to your workplace, church, community center, or other locale on our classes page. Interested in bicycling to work? Here are resources and tips to get you started and inspired. Save time. If your commute is less than 4 miles long, riding a bicycle is likely to be as fast, if not faster, than commuting by car or public transit. Save money. 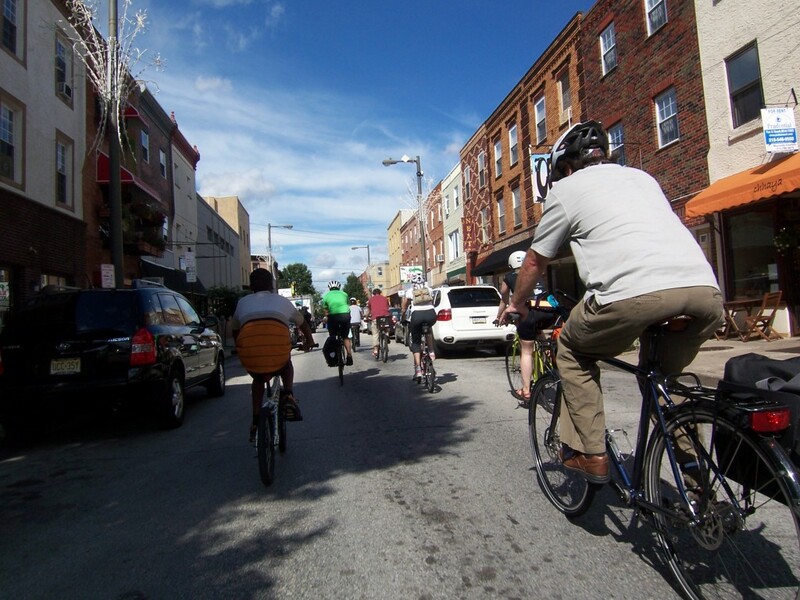 The average monthly cost of bicycle ownership is $25, significantly less than the monthly cost of a SEPTA pass or car ownership. This infographic examines the money you can save by commuting by bike. Exercise. Bicycling is good aerobic exercise. In a busy work day, combining your commute with exercise saves time and gym costs. Lowers stress. Getting daily exercise is proven to lower stress, improve health and productivity, and counteract the negative impacts of desk-bound jobs. Have fun. Bicycling is fun! Given the choice, wouldn’t you rather do something fun than something not fun? The most common concerns people have before bike commuting are about arriving at work looking presentable. “Won’t I be super sweaty? My hair will get all messed up!” This is less of a problem than you think. If your commute is less than four miles, and the weather is mild, a leisurely pace will not get you sweaty. If you are worried, you can bring a hand towel for any needed post-ride drying off. Or ride in workout clothes and simply change at work. Bicycling is also more compatible with work clothes than you might think. Bicycling needs not put undue strain on dress pants, jackets, ties, or even skirts. Simply put a rubber band around your right pant leg, or tuck it into your sock, to keep it away from the chain. 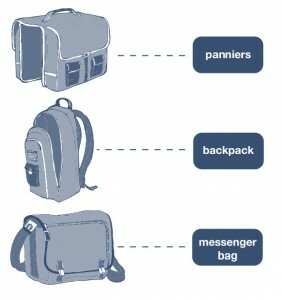 Panniers: Provide larger storage area without straining your body, and make for a more stable ride. Downside is they are more expensive and require a rack on your bike. Backpack: Cheap and easy to carry off-bike. Downside is an overloaded bag can strain your back or impair balance, or make your back sweaty. Messenger bag: You’ll look super cool, it’s easy to access while on-bike, and you can support local businesses by buying one. The downsides are sweaty back, less stable, and not designed for walking around. Is there a trail you can take part of the way? The Circuit website can show you trails in the Philadelphia region you might not know about. If your commute takes you from the suburbs to the city, or visa versa, you can combine a bike ride with public transit. Many people bike “the first mile” of their commutes – ie, biking from home to a train station, where they either lock their bike up or take their bike on the train. Our Bikes on Transit page has rules about taking bikes on transit. Now that bike share has arrived in Philadelphia, suburban train commuters are able to more easily bike on both sides of their train ride. Just ride your bike to the train station, lock up, ride into the city, and then take a bike share bike to your final destination.